The core area of Anselm Brandi-Dohrn’s expertise is advising and representing, in and out of court, businesses in intellectual property matters, notably in patent and trademark licensing, in IT law and in unfair competition. Add to that public procurement law as one of his focal points. Anselm Brandi-Dohrn has more than 20 years of experience in negotiating transnational contracts (distribution, international licensing agreements, cooperation, R&D) in the fields of software, pharmaceuticals, biotech, nutritionals, basic products and medical products. His theoretical knowledge and practical experience in international license agreements are reflected by his US license as a Certified Licensing Professional (CLP). 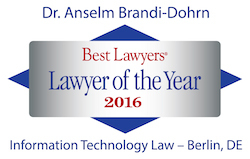 As longstanding Chairman of the Board of the German Association of Law and Computer Science (DGRI), the country’s leading think tank for IT law, Anselm Brandi-Dohrn has exceptional experience in all legal aspects of current and debuting IT business models. This keeps him in high demand for speaking engagements on intellectual property rights and IT law, especially in an international context, at national and international conferences. His clients include national and international technology companies of all sizes in the hard-/software, new media, Internet, gaming and life sciences sectors.